The ketogenic diet has taken the world by storm, and deservedly so: its results in helping people lose weight, manage chronic health conditions, and simply feel great are unmatched. Bestselling cookbook author Maria Emmerich sits at the forefront of the keto movement and has become the go-to source for high-fat, low-carb recipes that both please the palate and nourish the body. With Keto Restaurant Favorites, Maria delivers once again by putting a new and unprecedented twist on ketogenic cooking. Eating keto doesn’t mean that you have to give up the dishes you love! Instead, Maria shows you how to re-create those recipes, keto-style. Keto Restaurant Favorites answers the demand for a one-stop cookbook that allows you to easily replicate your favorite restaurant cuisine in your own kitchen. Maria’s recipes masterfully mimic the dishes you love using healthy, readily accessible ingredients. In addition to classic American fare, this book offers recipes for a variety of cuisines, including Italian, Chinese, Mexican, and Thai. Maria even includes favorites from the kids’ menu! 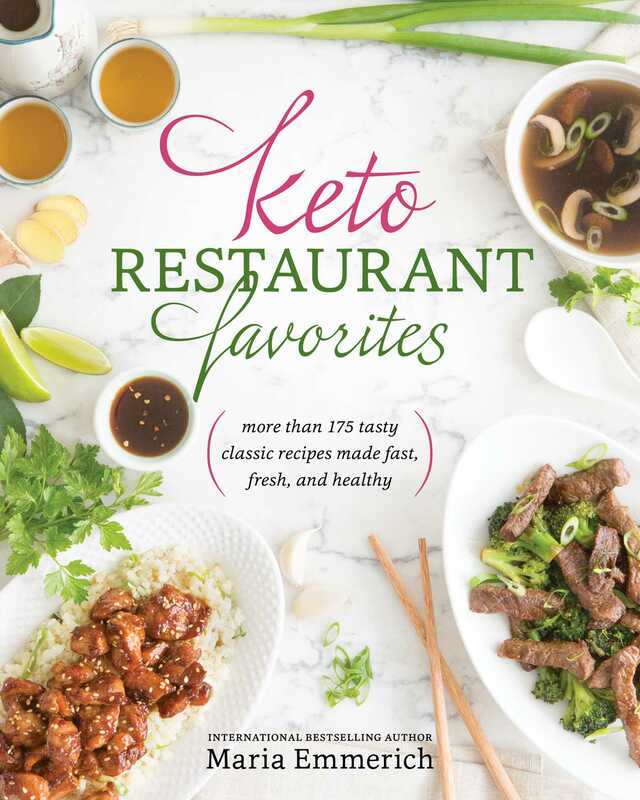 With nearly 170 recipes covering a broad spectrum of restaurant cuisine, Keto Restaurant Favorites is sure to please even the pickiest eaters. Say goodbye to feeling deprived! This book gives you all the tools you need to re-create your favorite dine-in and takeout offerings in a healthy and delicious ketogenic way.